I think we were staying at John Hammond’s house. 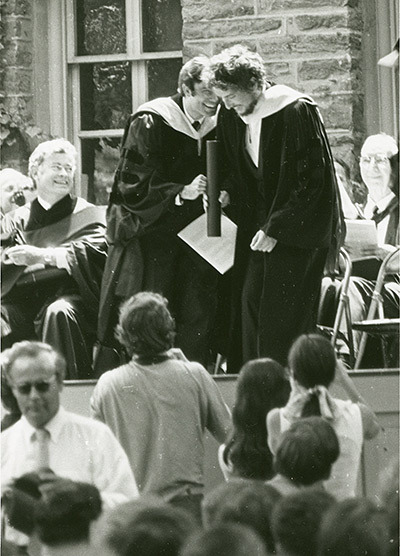 Sara was trying to get Bob to go to Princeton University, where he was being presented with an honorary doctorate. Bob didn’t want to go. I said, ‘C’mon, Bob it’s an honor!’ Sara and I both worked on him for a long time. Finally, he agreed. l had a car outside – a big limousine. That was the first thing he didn’t like. We smoked another joint on the way and I noticed Dylan getting really quite paranoid behind it. 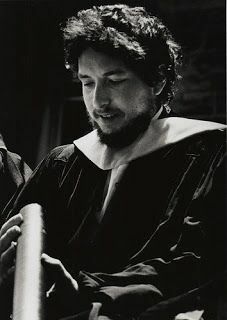 When we arrived at Princeton, they took us to a little room and Bob was asked to wear a cap and gown. He refused outright. 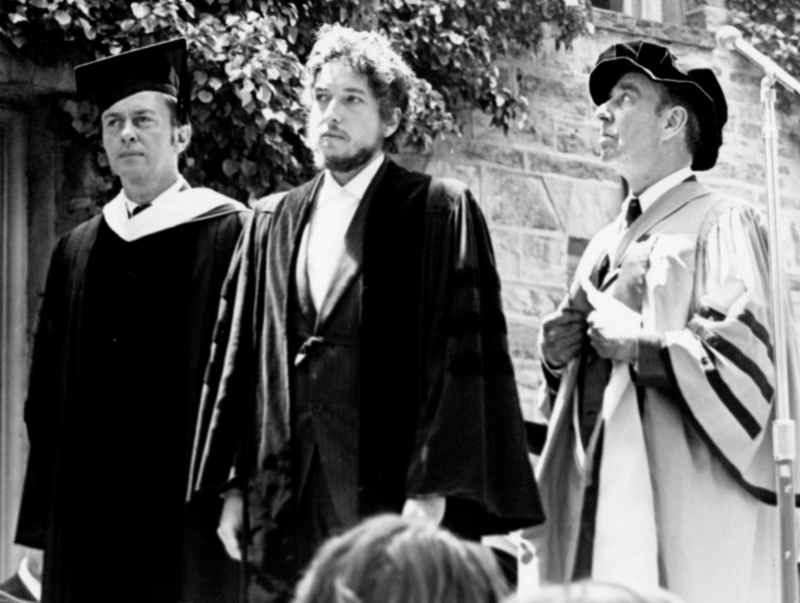 They said, ‘We won’t give you the degree if you don’t wear this.’ Dylan said. ‘Fine. l didn’t ask for it in the first place.’ … Finally we convinced him to wear the cap and gown. I´m pretty sure he did not. The Crosby quote is from my interview with Crosby/Nash in an old Telegraph magazine (UK) published by the late great John Bauldie. 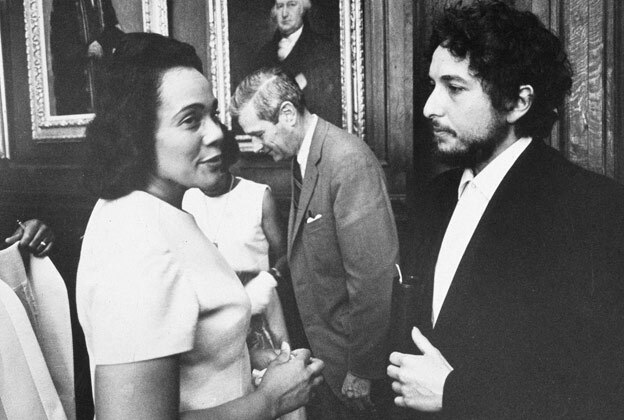 The whole interview was about their encounters with Bob & his music. The one with the portrait of Washington, he looks a bit like Lincoln. Weird. 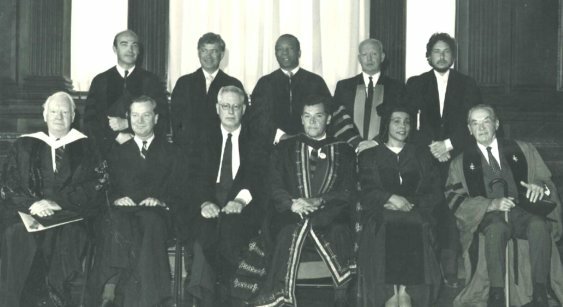 The second one (hand on shoulder) is not from Princeton but from Isle of Wight, press conference, 1969. Thanks Marie, I will remove it asap.